Mr. Sparkles is a character that appears in WarioWare Gold. He is a bodybuilder who regularly weightlifts his signature frying pans, and is notable for, besides his build, his enthusiasm and constant smiling. Mr. Sparkles first appears on a television program which catches 5-Volt's attention. 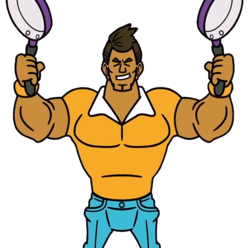 He advertises a set of frying pans, but advises customers not to buy them until they get into shape, as the pans are allegedly heavy. Out of boredom, 5-Volt decides to partake in the bodybuilding exercise herself, helping her retrieve 9-Volt's dropped Nintendo 3DS later on. Mr. Sparkles appears as a deception in the Sneaky Gamer mode of the game, lifting 9-Volt's television rack in place of 5-Volt to reveal himself, and may also appear on TV when it is on. Rank C – Mr. Sparkles brims with energy and keeps his smile turned all the way up, no matter how hard the workout. Rank B – Mr. Sparkles has big fans among late-afternoon TV viewers. It's likely his big arms or big smile that does it. Rank A – Mr. Sparkles goes to a gym known for its celebrities, like that wrestler who gets interviewed all the time. Mr. Sparkles' rank A card states he frequents the same gym as a "wrestler who gets interviewed all the time," presumably a nod to the Rhythm Heaven series' Ringside game and its protagonist. ↑ AbdallahSmash026. WarioWare Gold - All Challenge Modes!. YouTube. This page was last edited on April 14, 2019, at 21:15.